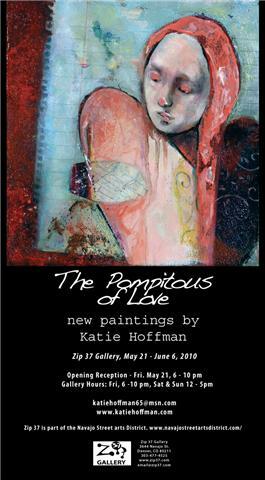 New paintings by Katie Hoffman opening this Friday, May 21 at Zip 37 Gallery. Reception from 6 to 10 pm. If you’re in the Denver area, please come by for a glass of wine and a nosh. I’d probably love to see you. The show runs from May 21 to June 6, and the gallery is open from 6 to 10 pm on Fridays and from noon to 5 pm on Saturdays and Sundays. This entry was posted in art, contemporary art, Denver, fine art, new art, painting and tagged Katie Hoffman, Opening Reception, The Pompitous of Love, Zip 37 Gallery. Bookmark the permalink. G.R., I wish you were in the area, too. It would be cool to meet you. & thanks for your good wishes!